These pages focus on the Atari 8-bit line of computers. The main feature are the original articles in which Turbo-Basic XL and the accompanying compiler were published. 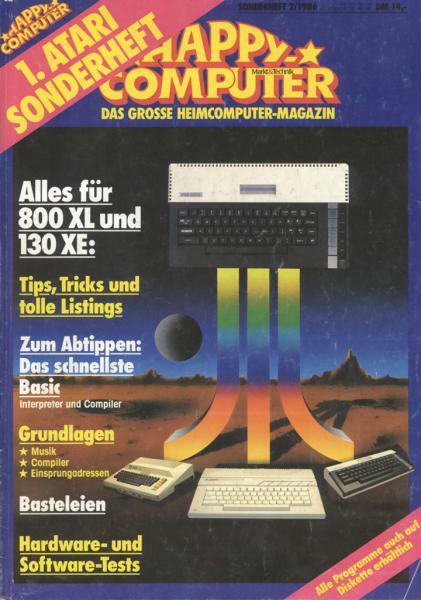 Turbo-Basic XL was published at the end of 1985 in German Happy Computer magazine, a very popular home computer magazine at the time. The compiler was published later in a special issue of Happy Computer focusing on Atari computers (Turbo-Basic XL was also published again in this issue). The scans that are provided on these pages were taken from the special issue. Happy Computer magazine was shutdown by the beginning of the Nineties. Articles Copyright 1985, 1986 Markt & Technik Verlag. Used without permission. Note: PLEASE BE AWARE THAT ALL ARTICLES ARE IN GERMAN! To comment, send e-mail to Thomas Meyer.